We have the capability to perform a wide variety of jobs, from small intricate parts to large structural steel beams and columns. We fabricate and repair items in steel, stainless steel and aluminum. One of our specialties is the fabrication of railings, both commercial and residential, made from either steel or aluminum. 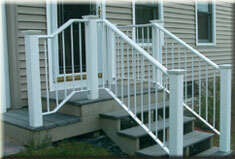 We offer different finishes such as prime and paint, hot dipped galvanized and powder coating. East Coast Welding has been providing quality aluminum welding services, portable welding services and Stainless Steel Welding services in New Hampshire and the surrounding areas for over 25 years. We provide portable welding services for a variety of welding jobs such as light fabrication work, bracket repair, hitch repair, trailer repair, truck body repair, onsite landscape and construction equipment repair, marine repair, aluminum dock repair and more. East Coast Welding has extensive experience with many complex alloys and is frequently called upon to develop unique and advanced welding solutions for its many clients. We have the capability to perform a wide variety of jobs, from small intricate parts to large structural steel beams and columns. We fabricate and repair items in steel, stainless steel and aluminum. Feel free to contact us for a quote on any of your custom aluminum welding and/or custom stainless steel welding needs, no matter what the size of the job may be.